The South Bend Youth Symphony Orchestras (SBYSO) wraps its current season on Sunday, May 7, with its concert at IU South Bend’s Campus Auditorium. 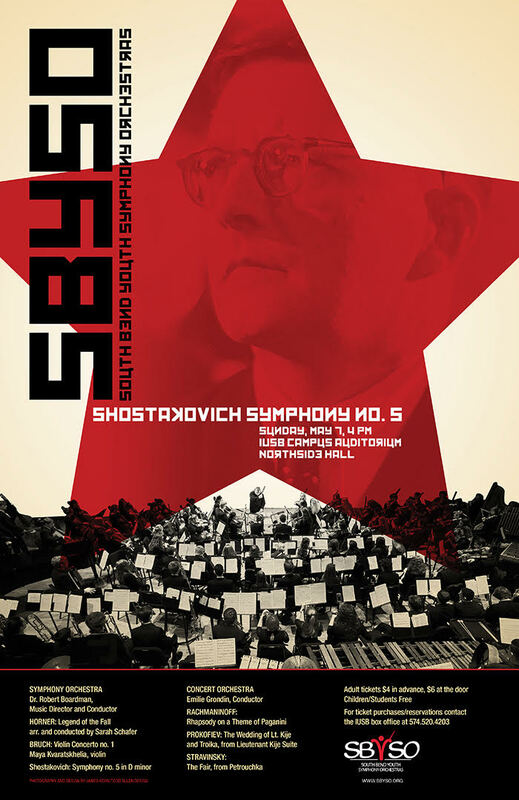 This performance is a “Russian soviet-themed concert, featuring Dimitri Shostakovich’s Symphony no. 5, which he composed under fear of being sent to a Gulag where he almost certainly would have died,” says Robert Boardman, music director and conductor for the SBYSO. “The younger Concert Orchestra will perform arrangements of Russian works by Stravinsky, Prokofiev, and Rachmaninov,” says Boardman of the continuing theme of the performance. The SBSYO will recognize the graduating seniors at the performance, and announce music scholarship winners. They will also be participating in Give Local in St. Joseph County, on May 9. The SBSYO has had an exciting season, including a performance in November featuring award winning saxophonist Timothy McAllister joining the SBYSO to perform Jorge A. Muniz’s Saxophone Concerto. “In February, we gave our third annual performance in the DeBartolo Center for Performing Arts. It was the first time a youth symphony had permission to perform music from ‘The Fellowship of the Ring,’” says Diane Persin Economakis, executive director of SBSYO. “We are looking forward to Give Local for that reason, it is so significant for our organization,” says Economakis of giving back to the community. “We want to thank the Joshis for what they’ve allowed us to do,” she says, referencing the Georgina Joshi Endowment for the SBYSO that was created in 2015 through the generosity of the family of Yatish Joshi and Louise Addicott-Joshi. The May 7 concert will be held in the Campus Auditorium at 4 PM. Tickets are available in advance for $4, and $6 at the door, students are free. For any question or to purchase tickets, please contact the box office at 574.520.4203.